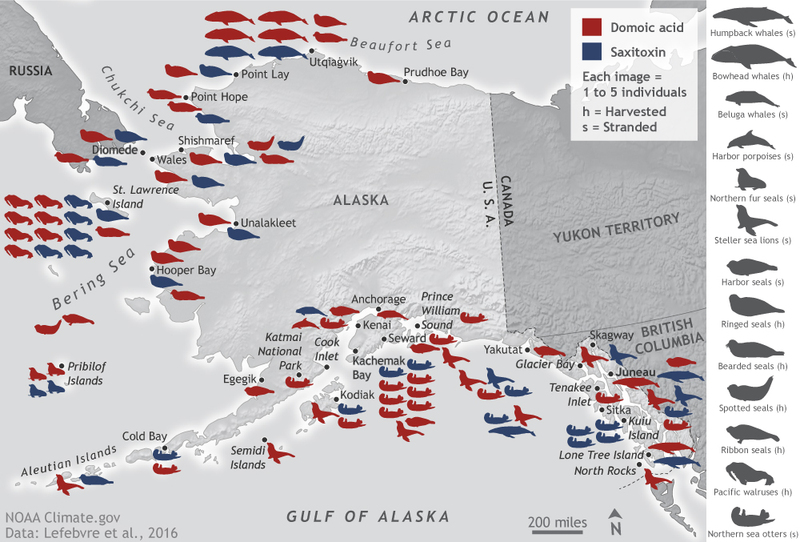 This map shows the location and kind of toxins detected in marine mammal species across the Alaskan Arctic sampled from 2004 to 2013, either after the animals were harvested (h) or stranded (s). Each icon stands for between one and five individuals of each species: humpback whales, bowhead whales, beluga whales, harbor porpoises, northern fur seals, Steller sea lions, harbor seals, ringed seals, bearded seals, spotted seals, ribbon seals, Pacific walruses, and northern sea otters. The neurotoxin domoic acid (red) was detected in every marine mammal species shown on the map. Species that tested positive for saxitoxin are colored blue. Most of the toxin concentrations measured in these animals were considered low, but they highlight the escalating risk of potential health impacts to marine mammals with increasing toxin presence in the Arctic. This increasing risk of exposure, combined with the prevalence of traditional hunting and fishing activities among Alaska natives and residents, poses a unique economic and public safety challenge in the Alaska Arctic—one that may worsen with future warming. Anderson, D.M., Richlen, M.L., Lefebvre, K.A. 2018. Harmful Algal Blooms in the Arctic. 2018 Arctic Report Card. Lefebvre, K.A., Quakenbush, L., Frame, E., Huntington, K.B., Sheffield, G., Stimmelmayr, R., Bryan, A., Kendrick, P., Ziel, H., Goldstein, T. and Snyder, J.A., 2016. Prevalence of algal toxins in Alaskan marine mammals foraging in a changing arctic and subarctic environment. Harmful algae, 55, 13-24.